Farmer’s markets are nothing new in Richmond. You can find one somewhere almost every day of the week. But there’s one thing you can’t find at most markets around town, something that fills everything it meets with bubbly joy: BEER. Unable to “bring beer to South of the James,” due to various licensing issues, Karen Atkinson had a vision to, “bring the market to the beer,” and she and Hardywood Brewery have done just that! 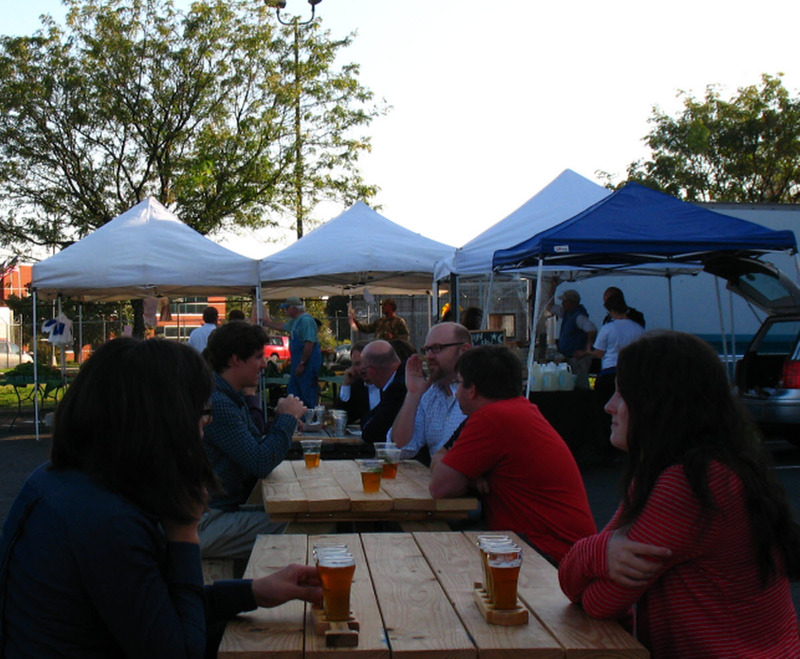 This will be the third such market, and it promises to be another gorgeous day for enjoying an artisan brew while picking up last-minute dinner ingredients. Upon my visit last week, I got to know a vendor that, despite being at the SOTJ market every week, I had never seen before, The Village Garden. Today’s recipe is inspired by some of the unique flavors they bring to the market table – specifically the flavors of Thailand. Last week, I was looking for peppers for a Green Papaya salad, and owner David Hunsaker helped me find just the right little firecrackers for the task. 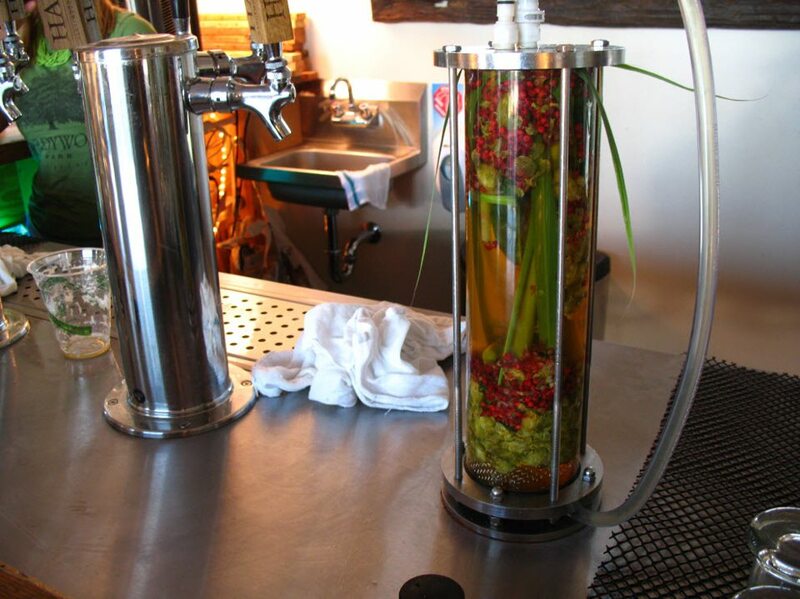 The brewers at Hardywood have also obviously been inspired by The Village Garden – today’s special brew features their fresh lemongrass, Thai peppers, and Thai basil. It has a great balance of heat and a burst of clean lemon flavor, offset by the slight almost anisette taste of the basil. I can’t stress enough that you should not miss this brew. You can take home your own lemongrass today as well – The Village Garden will have plenty on hand, plus all the peppers and pepper blends they’re known for. Stop by and tell David I sent you! Here’s a recipe to inspire your culinary trip to Thailand by way of the Hardywood Market. Put the galangal, cilantro roots, lime leaves, lemongrass and 4 cups of water in a saucepan and bring to the boil. Add the fish sauce and lime juice, decrease the heat, and simmer for 10 minutes. Remove the cilantro roots. Add the coconut milk, bring back to a boil and boil for a couple of minutes. Add the chicken pieces and cook for just a minute or so, until the chicken is soft and milky looking and cooked through. Throw in the chile and mix well. Serve in bowls with the cilantro leaves roughly chopped and scattered over the top. *There’s a whole lesson on kaffir lime leaves here, including what to use if you don’t happen to have them on hand…because who has kaffir lime leaves on hand?? Market runs from 4-8 tonight at. For all the details, including directions, go here. Thank you so much for the wonderful article. Both David Hunsaker and I (Barbara Hollingsworth) are the owners of Village Garden. We both are enjoying working hard to bring good, local food to the RVA. Wow, what a nice article—thank you for the kind words! I want to give due credit to Barbara Hollingsworth, my partner in life and work, for making Village Garden’s market presence what it is. If things look beautiful at our booth and on your plate, it is due in large part to her love (and creative flair) for what we do, and of course the brown knees we both get tending delicious, organically produced veggies and herbs in the garden! PS–if you needs a few fresh kaffir lime leaves, guess what? Just let us know in advance—along with lemongrass, stevia, pineapple sage and others, it is one of many exotics we grow in our year round heated greenhouse!